First recorded by The Drifters (R&B #10 1956). Other hit versions by Dion (US #2/R&B #5 1963), Billy “Crash” Craddock (US #33/MOR #23/C&W #1 1974). Also recorded by The Beach Boys (1965, released 1993), Donald Fagen (1982). From the wiki: “‘Ruby Baby’ was written by the hit songwriting team of Jerry Leiber and Mike Stoller (‘Hound Dog‘, ‘On Broadway‘). It was first recorded by the Drifters, who scored an R&B hit with the song in 1956. Dion covered ‘Ruby Baby’ in 1963, scoring a Top-5 hit. In 1974, Billy ‘Crash’ Craddock topped the US Country chart with his cover version. First recorded by The Dell-Vikings (1956). Hit versions by The Del-Vikings (re-recording US #4/R&B #2 1957), Dion (US #48 1962), The Beach Boys (US #18 1981). From the wiki: “‘Come Go with Me’ was written by C. E. Quick (aka Clarence Quick), an original member of the Doo-wop vocal group The Del-Vikings (also spelled ‘Dell-Vikings’ on Dot records releases, with no dash). The song was originally recorded by The Del-Vikings in 1956 and was released by them on Fee Bee Records with Quick as the lead vocalist. The 1957 re-recording released on Dot Records featured Norman Wright as the lead vocalist. Written and first recorded (as “It’s Great to Be Young and in Love”) by Mort Shuman and Doc Pomus (1958). Hit version by Dion & The Belmonts (US #5 1958 |UK #28 1959), Marty Wilde & The Wildcats (UK #2 1959), Craig Douglas (UK #13 1959). Also recorded by The Wailers (1965). From the wiki: “‘Teenager In Love’ was the first big hit co-written by Mort Shuman and Doc Pomus (‘Save The Last Dance For Me’, ‘This Magic Moment‘, ‘(Marie’s the Name) His Latest Flame‘), and had as its genesis an earlier Pomus-Shuman collaboration titled ‘It’s Great to Be Young and in Love’. 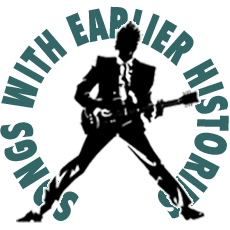 ‘Teenager in Love’ is considered one of the greatest songs in rock and roll history. It is on the list of Rolling Stone magazine’s Top 500 Most Influential Rock Songs. Pomus was inducted into the Rock and Roll Hall of Fame in 1992; Shuman was inducted in 2010.